Instead of throwing away old aquarium decorations, give them a paint job to spruce up the aesthetics of your tank. 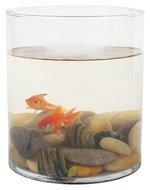 It is important to select nontoxic paints that are safe for aquarium use, as some paints can harm your fish and the other inhabitants of your tank. By harnessing your creativity, you can create a one-of-a-kind tank that will become the focal point of the room. Whatever the decoration you intend to paint -- rocks, sculptures or frag plugs -- you must be sure they are clean and dry before applying paint. Make any desired changes to the object's shape or size before prepping the surfaces. Remove any paint or grime present with medium-grit sandpaper. Wipe the object with a damp, lint-free cloth and allow it to air dry for at least one hour before proceeding. Many aquarists use two-part epoxy or latex-based acrylic paints for their aquarium decorations, but it is imperative that you make sure any paints used are aquarium safe. Formulas differ from one manufacturer to the next, as well as among the products offered by a given manufacturer. Check the product label to see if the product is fish-safe and durable when submerged. Avoid any paints or sealers that have mildew-fighting components, as these chemicals may harm your fish. If you have any doubt about a paint, contact the manufacturer or consult with your veterinarian. Use small art brushes to apply the paint to the decorative objects. Apply two thin coats, rather than one thick coat, to facilitate the drying process and ensure full coverage. Allow the first coat of paint to dry before adding the second coat. Once the second coat of paint has dried thoroughly, apply a thin coat of aquarium-safe, clear sealant to protect the paint. Allow the first coat of sealant to dry and then apply a second coat. Feel free to use your imagination when painting your aquarium decorations. If you like, you can paint the items in natural-looking colors, but you can use bold colors to help express your creativity. For example, you could paint the decorations to match your favorite sports team, or paint them to help set off the colors of your fish. If your aquarium harbors glow-in-the-dark fish, consider using glow-in-the-dark paint for the decorations. Additionally, experiment with different brush strokes, patterns and textures to make the decorations interesting to look at.